Fill in the empty cells of the following table. We'll introduce the notions of convergent and divergent. You should be able to recognize convergent and divergent sequences by their graphs. We'll also introduce the Fibonacci sequence. 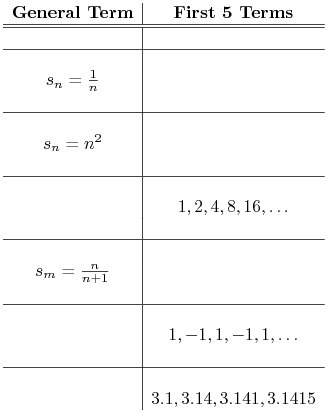 The solutions to the following examples are located below. Give a general term for the following sequence. Write an algebraic definition for the recursive sequence. Does the sequence converge or diverge? Remember from our work with Riemann sums that this represents the sum of the numbers from 1 to , and so we could develop the terms in the sequence by simply adding numbers to preceeding sequence elements. Or, we could evaluate the terms in the sequence as usual. At first, this one is a bit odd. But, notice that and all have a 6 in the numerator. Writing all of the terms in the sequence like this (multiplying top and bottom by fractions to maintain equality) gives the following. For a different formulation, see example 4b in the text. This sequence is monotone increasing (actually, it is strictly monotone increasing and bounded (since ). Thus, by Theorem 9.1, the sequence converges.